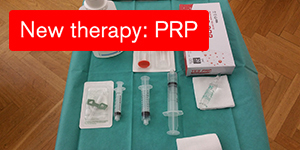 For performing an Platelet-Rich Plasma (PRP) injection first blood will be taken from the patient. The platelets will be separated from other blood cells and their concentration is increased by activating and centrifugation. Blood contains liquid (called plasma) and solid components: red and white cells and platelets. 1993 I have started my orthopedic practice at Prinzregentenstrasse 54. January 2017 we moved to Prinzregentenstrasse 91 right at Prinzregentenplatz. You will find a just renovated first floor clinic in a typical ancient Bogenhausen building of last century. My orthopedic diagnostics and treatment concerns fundamentally the total person from head to toe.Including my major competencies: Rheumatology, sportsmedicine, chiropractics and physical therapy. My philosophy: Against the stream! I am against impersonal medical treatment centers! A patient has confidence only in one – his doctor. He doesn’t want to be handed from one therapist to the other. The practice rooms are located in the pedestrian zone of Grünwald, just 50 meters further of final station – Derbolfinger Platz – of tram line 25. You can enter the practice via Luitpoldweg. Also there are plenty of parking lots in Rathausstrasse and Schloßstrasse.